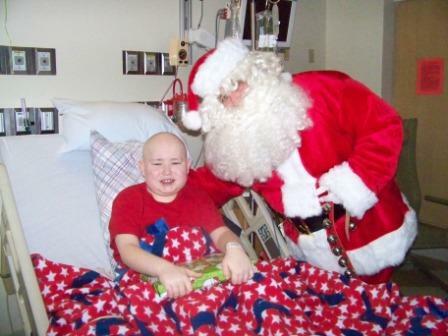 Santa paid a visit to some brave kids battling cancer at Cardinal Glennon, bringing gifts and some sweet treats. North Star Frozen Treats, Prairie Farms and the Town Planner teamed up with Friends to give ice cream, milk and cookies to the kids, along with a special present. Each child on the 4th Floor Oncology Unit received art kits with a drawing pad, while the kids in the Bob Costas Center were surprised with stuffed animals, which came with a certificate to name a star! The kids enjoyed the healthy dose of holiday spirit on a tough day of treatment. We would like to thank the volunteers, sponsors and Dan & Rocky Rosen of the Town Planner. Also, thank you to Chris McQueen from North Star Frozen Treats for providing the ice cream and Matt McClelland from Prairie Farms for providing the milk! Check out this article and video from KSDK Channel 5!